The news is breaking: Highland Park has a solar-powered streetlight. On Thanksgiving, we gathered together at dusk. The sunset was particularly beautiful that evening. The glow lasted in a sky with few clouds. As darkness fell, we filled the empty street, forming a ring around the light. It was like watching water to boil – we knew it would happen, we didn’t know when. It got quiet. Moments became hours. All the work, the stress, logistics, arguments, fundraising, became compressed. We’d scrambled for funding and footing, scheduled and rescheduled, and hashed and rehashed. And just when it seemed like we’d have to postpone, the money came, the logistics became logical, and on Tuesday, Craig from SolarStreetlightsUSA drove out here to put it in the ground. AJ was up in the cherry-picker with him, wiring the wires and connecting the connectors. The press, the city, and the people were all present. By Thursday, the news had already broken, and this ceremony was effectively unimportant. But it was Thanksgiving. This was what we’d waited for. It was a small crowd – Andre, AJ, Lawrence (dressed as St. Nick), my family, a few people from the neighborhood. In the shadows of the original Model-T factory, we waited to see our work come to fruition. With a saint-like mercy, the light popped into life. A cheer rose from the assembled crowd. A couple stopped their car and talked to us, congratulated us, thanked us. As the dark overtook the street, the bright spot beneath the light came into clearer focus, and I drove off to see the new James Bond movie with my family. It’s been a long road to get here. We selected a location at 150 Victor St., out front of a local auto shop and rehearsal space. It’s just down the street from Red Hot’s, the first Coney Island in the state of Michigan. And it’s in the shadow of Henry Ford’s first assembly line, the factory that built Highland Park. Now it stands empty, derelict, a controversial, neglected part of history. I come from New York City, a place known for neglecting its history. Both New York and Highland Park have demolished beautiful, historic, valuable buildings. New York destroyed the original Pennsylvania Train Station because property values rose in the neighborhood it created. Highland Park destroys solidly built homes to reduce blight, because the factory left town and the people left with it. The land in New York was too valuable to allow an old train station, no matter how beautiful, historic, and iconic, to remain standing when someone could make far more money with a skyscraper. No investor will support a factory and a community economy in Detroit when you can pay slave wages and ignore safety in Mexico, where people have been made desperate by years of economic imperialism. It seems like no place is safe from what AJ calls the investor’s mentality – the obsession with short-term gains. Maybe that’s my own bias talking, so I guess I ought to explain it with experience. I’ve been down to West Virginia once before, for a march against mountaintop removal mining. It was to protect Blair Mountain, the site of the first armed labor uprising in US history. 200 miners marched 5 days to the Battle of Blair Mountain, where the coal companies brought in fighter planes and militia to put a stop to them. Workers with rifles went up against bombers for the right to a dignified wage. They fought without hope of victory, eventually throwing down their guns in surrender. But it was the spark that set off the labor movement in this country. As shells fell on Blair, the unions in Highland Park were born. Miners died for the auto-workers. As we retraced their steps, we were dogged by police and counter-protestors. Often, you could see supervisors behind the angry crowd, video-taping, ensuring loyalty to King Coal. When I left, it was hard to imagine the hardship I’d experienced as an everyday thing for the people whose work is to resist forces with more power and influence than they could hope to achieve. Last week, Patriot Coal agreed to put and end to its mountaintop removal mining in the Appalachian Mountains. This is a relatively small victory – one company’s policy does not necessarily lead to sweeping change. But each small victory grows, connects, sprouts others. A recent story broke about new solar training programs in West Virginia, just before our light went in on Victor St. Every failure is also a lesson. The miners may have lost Blair Mountain, but their actions have echoed in Detroit long after they were gone. We’re part of a larger story – of a world responding to threats larger than we’ve ever seen before. Bill McKibbon is by far the best at amalgamating the data on climate change and I don’t need to echo his statistics. Farming is getting harder, yields are getting smaller. Hurricane Sandy wrecked the East Coast. Temperatures are at record highs, wildfires are reaching new levels of destruction, fresh water is becoming a valued commodity, island countries are planning for total evacuation. And at the same time, Patriot has stopped MTR, Earthships are being built in New Mexico, and Highland Park has its first solar streetlight. Across the country, people are stepping up to the challenge. This is bigger than us. It’s bigger than Highland Park, West Virginia, New York City, the United States. This one streetlight is part of a transformation. Bill McKibbon points out that if you were a betting man you’d put your money on humanity’s extinction. But as members of our species, as members of families, as parts of communities, as people, we aren’t allowed to make that bet. I’m betting that we’re capable of change. All the work of our lives will be footnotes in a history book, if we’re very lucky. That’s all Blair Mountain ever amounted to. But we live on in the world we help create, and those who stand on our backs. We’ve got five days left in our IndieGoGo campaign, and just over $1000 to go. AND we’ve just received word that Keith and Diane Hoye have a location for the next light, and match our fundraising! They’re putting it out front of the apartments they’re fixing up on Candler St. – previously used by Henry Ford as hospitality suites for guests to his Model-T factory. They’re farming and interested in getting solar electric systems for their units. They want to open up a hostel for young people to stay here in Highland Park for a reasonable price. All donations to the indiegogo campaign above our goal will go towards the next streetlight, with funds matched by Keith and Diane. This is a blog post by Sustainable Community Organizer Jackson Koeppel. You can read Jackson’s previous blog post here. 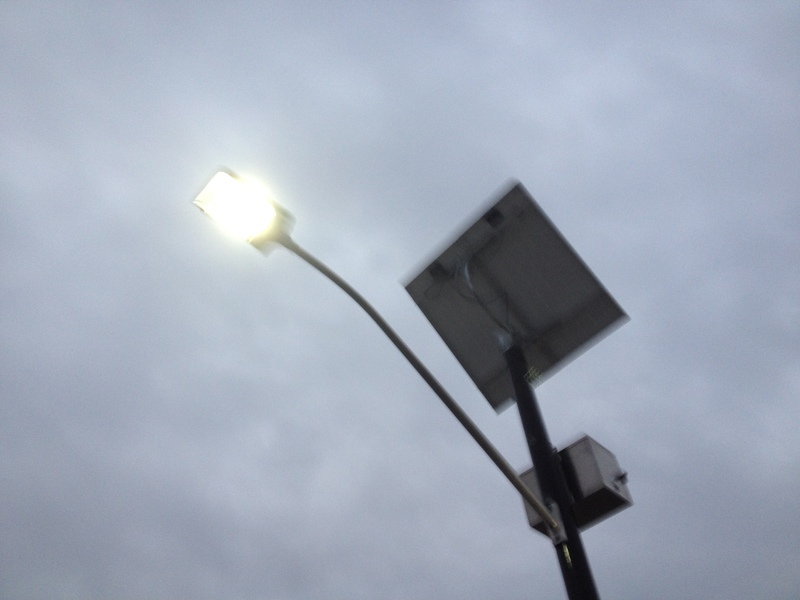 This entry was posted in Local Initiatives, Local Programs and tagged blair mountain, climate change, highland park, solar, solar streetlights, soulardarity, west virginia by jkoeppel. Bookmark the permalink. This post gave me the chills (literally). Such an important and well written story.